The Chevrolet Cruze compact sedan is one of the best-selling Chevy vehicles. It’s efficient, affordable, stylish, and packed with thoughtful amenities. The upcoming 2019 Chevrolet Cruze will keep the momentum going with updates to its design and trim levels. Here’s what to expect from the new model year. Changes to the 2019 Chevrolet Cruze will be apparent immediately, thanks to updates to the front fascia. The new Chevy Cruze gets a bolder look with a wider grille and refreshed, modern accents. These new details give the Cruze a more sophisticated and upscale look, while maintaining the sensible design and affordability the model is known for. The 2019 Chevy Cruze will be available in a brand new hatchback trim, the Hatch LS. The current hatchback trims already account for a fifth of the Cruze sales, and this higher level trim will bring wider options to buyers looking for a five-door option. Certain trims of the 2019 Cruze will also offer new amenities. LT and Premier models will get remote start and automatic climate control, while the brand new Chevrolet Infotainment 3 system will be available as an upgrade to in-cabin technology. Test drive the new Cruze for yourself when it arrive on our lot here at Bradshaw Automotive. Automakers have had something of a falling out with diesel sedans amid the recent scandal, but Chevrolet isn’t one to back down. The American automaker recognizes potential when they see it, which is why we’ve been hearing rumors of a diesel-powered Cruze coming to the market over the past few months. Well, the 2017 Chevrolet Cruze diesel is now an official model following a pricing announcement. The 2017 Chevrolet Cruze diesel sedan will start at $24,670 with a six-speed manual transmission. Drivers who opt for the nine-speed automatic transmission can expect to pay at least $26,270. The automaker hasn’t announced pricing for the Cruze hatchback just yet. The first-generation Chevrolet Cruze diesel started at nearly $26,000, making the pricing of the latest model a welcome relief. All Chevrolet Cruze diesel models come with two years of SiriusXM satellite radio and OnStar with two years of 24 GB of data for the 4G LTE Wi-Fi hotspot. The base Cruze diesel comes with the LT trim and Convenience package that adds an eight-way power driver’s seat, keyless entry, heated front seats, and more. That package normally tacks on $850 to the price of a conventional Cruze. We here at Bradshaw Chevy Buick GMC Cadillac can’t wait for the latest arrival in the Cruze lineup! Colorado- The new edition includes 4G LTE, Wi-Fi, upgraded body and interior, and a choice of rear or four-wheel drive. Corvette- A new eight-speed automatic transmission is available in multiple models, along with a manual mode accompanied by a precise clutch and torque-converter. Cruze- This popular car will debut a new frontal design, along with a more stylish-looking inside cabin. Impala- The biggest upgrade the Impala receives for 2015 is improved gas mileage, which is something that everyone can appreciate! Silverado HD- The vehicle will show off a new interior, a softer body design, and the newest technology and connectivity upgrades. SS- While Chevrolet has yet to officially confirm it, the SS will likely be getting a new manual transmission to pair the car’s V8. Suburban/Tahoe- Both are full-sized SUV’s that are jam packed with new features, including new and improved interiors to give them a luxury feel, and V8 engines. 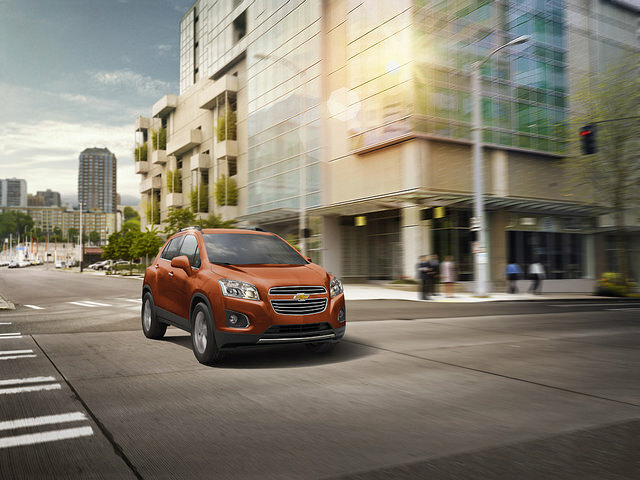 Trax- A mini crossover with the latest technology, this vehicle now includes 4G LTE and a touchscreen used for both music and other apps. See full specs on all these models at Caranddriver.com. Your Upstate South Carolina GM car dealer!